So I've been saving up tools for the last year and I'm about 2 tools away from having enough to build a full scale of the stool model I wrote about in my last post. I've been working on this particular design for the last 3 months and it's a stepping stone to building a larger rocker that I've been refining for much longer. 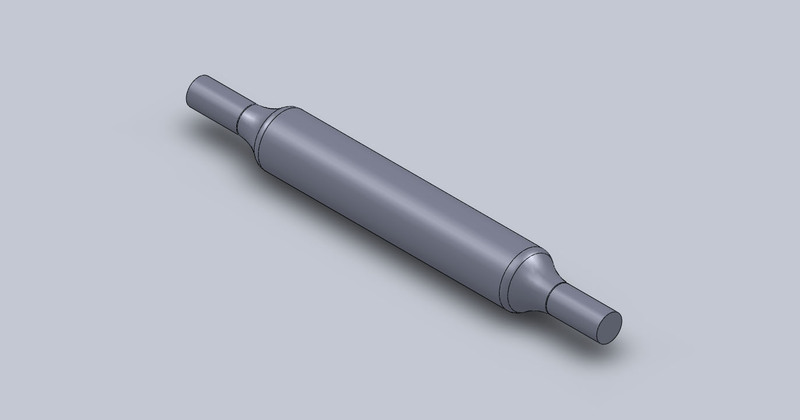 I'm rather excited to have a ratcheting auger handle made by Millers Falls Comapny on it's way to me from the US. While all my other tools have been sourced and bought in Ireland I'm fairly satisfied this tool has good re-usage credentials because of it's longevity, this model being made by the company since 1897 up until (I think) the 1940's. I'm very excited to be the one to keep this great tool in use. It was bought from Sandy Moss who runs sydnassloot.com and has a huge selection of interesting vintage tools for sale. The idea behind this stool is that it will be built using locally bought tools, from Irish wood and using no electricity in the building. I know this plan is racked with inescapable carbon miles from the tree felling to the production of the tools, but it's a genuine attempt to reduce the imprint of this particular piece of furniture. The other component of this idea is to build a product of high quality and utility, such that it becomes a piece of furniture without a use-by date. A piece people will want to hold on to and eventually pass down. I think products like these, heirloom products, are one of the best ways to produce things ecologically, in a way that appeals to the emotional rather than the simply pragmatic nature of people. Anyway, this post is about the 3D model of the stool I built, for a post on the physical scale model see here. This was done for 2 reasons. Firstly I wanted to work out the dimensions of the various parts of the stool. This will allow me to compile a cutting list and actually determine what tools will be required and at what stage in the construction. Secondly I was excited to finally be able to see the stool I've been working on for the last few months. That basically means that I was a little giddy. The 3D model was built in Solidworks and rendered in Photoworks, an add on to solidworks. I will be rendering it again, probably in cinema 4D at a later stage once I figure out how exactly to make wood textures look convincing in that program. 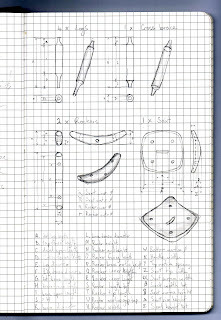 Firstly here are the sketches from which I built the solidworks model. The first one above is essentially an orthographic projection though initially it wasn't intended to be. 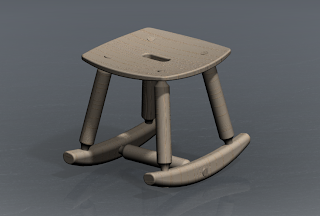 It was the first time I drew the stool in the current iteration of it's form. Towards the bottom of the sketch is a speculative idea of how the joints shall be made rigid without the need for glue or screws. 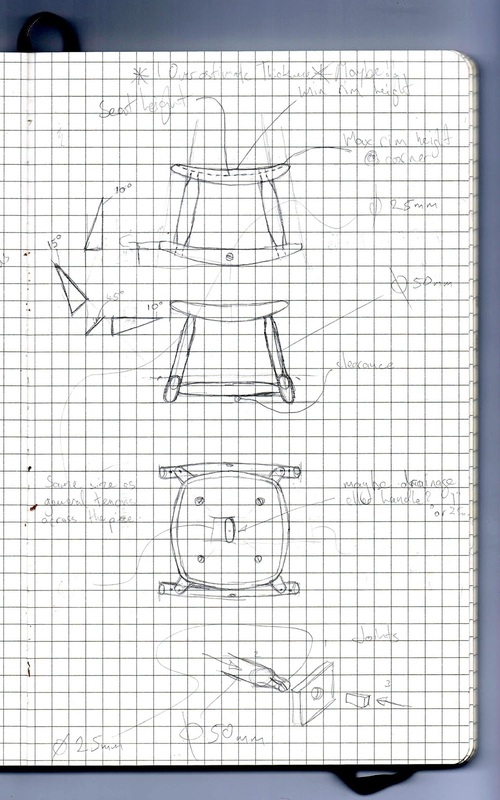 The sketch above breaks the chair into it's 4 distinct parts, the leg and brace are on top and the rocker and chair are below. 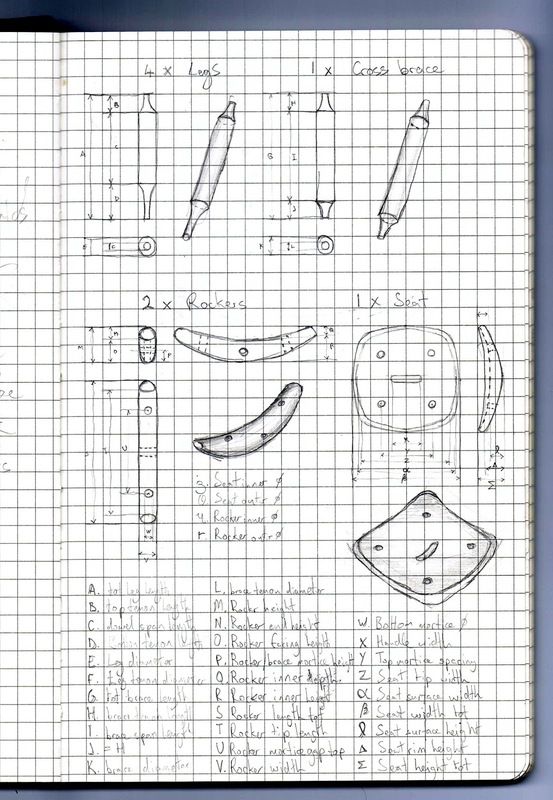 They are all given a rough orthographic representation and an approximate "3D" sketch. The list below was all the possible dimensions I might have to consider which I began listing in our very own latin alphabet but had to switch to the greek when I ran out of letters... I might have over-considered some aspects, though this exercise definitely brought up small things I had also overlooked. My overall goal dimensions for the chair, seat height, chair span, etc... were determined using Peoplesize, an anthropometrics software. 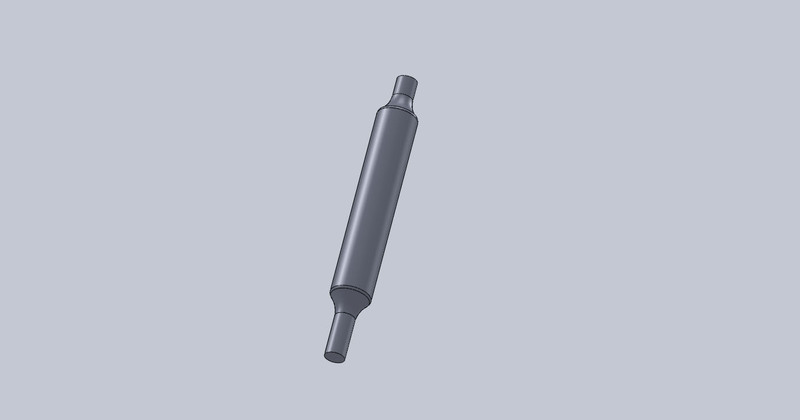 The first part I modelled was the leg as seen above. 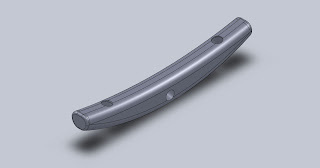 The actual part when produced probably wont have as pronounced a shoulder as the model as my intention is to blend the tenon (fancy word for sticky-out bit) and body of the leg over a much longer span than shown here, but this approximation will (for the purposes of this model) act and look close enough to the final piece. The next part modelled was the chair top. The piece you see above was modelled without the 4 mortices (fancy word for holes) taken out of it. 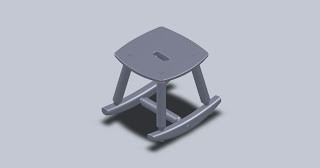 Those features were created when I put the pieces into an assembly of parts and used a "cavity" command to remove the then in-situ legs from the chair top. Next to be modelled was the rocker. This piece is probably the one that changed most from the original sketches. I was unsatisfied with the top and bottom radii I had initially suggested for this part. When I used the initial values I felt the rocker looked like it would produce too severe a rocking action. Both radii were increased by quite a bit to smooth that out. The mortices were removed from this piece in a similar way to the ones on the seat. Finally I built the brace that spans between the two rockers. This part, though shown here separately was built inside the assembly which helped me to determine the required dimensions of the part. Next the parts were assembled into the chair above (with, to be fair, a lot of refining in the process). I used a circular pattern command to make the 4 legs and a planar mirror command to make the two rockers. You may notice that the tenons on the legs and brace overshoot the surfaces from which they protrude. This was intentional. I could have "cleaned them up" but decided not to for this model. The chair, when first assembled, will have these protrusions which will eventually be split with a chisel, wedged for rigidity and trimmed to the surface. Finally I'm including this basic Photoworks render. I find Photoworks a bit limiting and cumbersome to use and have never managed to get good quality renders from it. In the same time it took to set this up I've produced much better renders in Cinema 4D, though that could be to do with familiarity as I would use C4D more often. 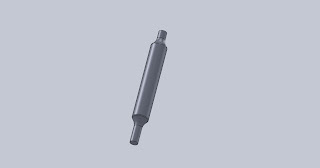 I used Photoworks in this instance as I wanted to familiarise myself with how it is integrated into Solidworks, as I had not used it for a long time. I'm much closer to production now and really do feel more confident now that I have this model. 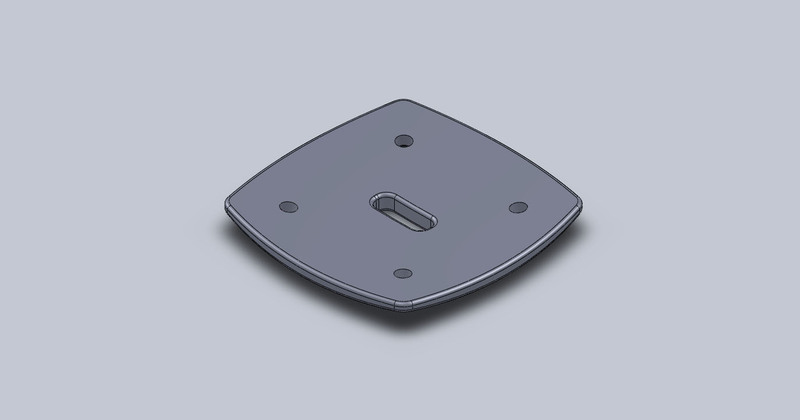 I've also now produced working drawings of both the individual parts and assembled chair through the DWG editor in Solidworks. This feature allows you to export your 3D models into 2D drawings and add annotations and dimensions to them. I also made a second assembly where I worked on determining the best cutting pattern to make the pieces from the smallest possible blocks of wood. I did learn more about the scale and dimensions of the final chair by building it in this medium. I have most things bar the two tools and the materials. I'll write more about the materials when I manage to get them. I'm trying to source unseasoned ash for the legs and maybe sessile oak for the seat and rockers. All in time.